Liczba stron: 42 Jest to ujednolicona liczba stron, która ułatwi Ci porównanie długości książek. Każda strona Legimi to 200 słów. 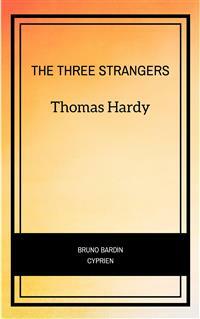 "The Three Strangers" is a short story by Thomas Hardy from 1883.The story is a pastoral history told by an omniscient narrator more than 50 years after the event. The sheep-stealer is a kind of folk hero who stole to survive and escaped by outsmarting his hangman. AMONG the few features of agricultural England which retain an appearance but little modified by the lapse of centuries, may be reckoned the high, grassy and furzy downs, coombs, or ewe-leases, as they are indifferently called, that fill a large area of certain counties in the south and south-west. If any mark of human occupation is met with hereon, it usually takes the form of the solitary cottage of some shepherd.